To provide the best nerve and muscle testing in Northwest Arkansas using the state-of-the-art equipment and techniques. Dr. Miles Johnson, M.D. and his staff serve the Northwest Arkansas area through seven clinics with state-of-the-art nerve and muscle testing (Electromyography or EMG). This focus allows the clinic to stay continuously abreast of new technological developments and techniques. 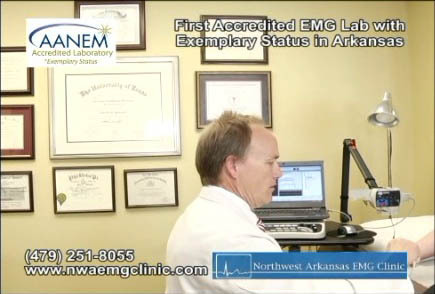 Since its birth, Northwest Arkansas EMG Clinic has been the area leader in Electromyography and is relied on by many hospitals and doctors in the area for reliable and quick results to better assist them in treating their patients. If you are new to EMG, visit our "About EMG's" page and the FAQ to find out how EMG's may be beneficial to you. Dr. Johnson and his staff create a friendly and professional atmosphere so that you will feel comfortable during your EMG. Admin One, Aetna, AMCO, American Family Insurance, Assurant Health, American National Insurance, Bekaert Corporation, Benefit Administrators, BMI Health Plan, Blue Advantage, Blue Card, Blue Cross/Blue Shield, Cigna, Corporate Benefits Services, Covenant Administrator, Definity Health, Employers Choice Health Plan, Evolutions, First Health, Galaxy Health Network, Golden Rule, Great West Healthcare, Health Advantage, Health Care Solutions, Health Choice, Health Link, Humana/Choice Care, Intrigated Health, Medicare, Medicaid / Arkansas & Oklahoma, Mercy Health, Municipal Health, Novasys, NWA IPA & Associates, Olympic/Sterling, One Call Medical, PHCS, Principal Life, Preferred Community Choice, Premier Care / Arkansas & Missouri, Provider Networks of America (Pro Net), Quall Choice of Arkansas (QCA), Railroad Medicare, Reserve National, SB Howard, St. John’s Premier Plus, Star Mark, Tri Care, Unicare, United Healthcare, Workman’s, Compensation, Personal Injury Claims.